Injecting into a tree requires a drill and the penetration of the protective bark, the drill holes are spaced around the tree and chemical is then injected with measured injectors. This treatment is a great way to deliver a chemical quickly and efficiently into the trees vascular system, results are good and chemical use is less than with other methods. The downside is the drill holes, there is nothing 'micro' about them, they are at least 4mm diameter and depending on species and age could be more than 4cm deep. Each treatment (every 2 - 5yrs for Elm Leaf Beetle) requires a new set of drill holes. A tree will usually callus (but not heal) over drill holes within a few years, particularly younger healther trees. This covering of the wound is good from an aesthetic perspective however the damage remains inside. The holes are an entry point for decay casuing pathogens, also the tree will actively shut the area around the wound down, ceasing to function in that area. Over many years the number of holes will impact plant function. The degree of impact will depend on a number of factors, if a tree is old and stressed possibly in a cool climate, it will be less able to deal with pathogens, less able to compartmentalize decay, less able to callus over. A young fast growing tree in Queensland such as an avacado will quickly callus over and put on new conductive tissue. 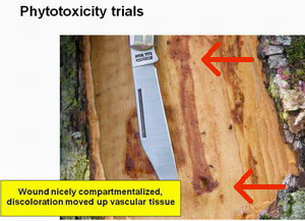 For these reasons our approach to Stem injection for any pest or disease (including Elm Leaf Beetle) is that stem injections should only be used in certain circumstances; for example the tree is going to be removed in the short to medium term or it is not possible to use other control methods. Some companies are now doing more stem injections, though this may (not 'will', just 'may') give better Elm Leaf Beetle control in the short term, long term it will cause permanent damage and possibly significant decay within the trunk. Sometimes it may be appropriate to use stem injection if there is an infestation and it is getting late in the year for soil injection. Principles of Modern Arboricultural Management. Trees are living things and all arboricultural management practices should accord with basic biological principles. For example, any pruning activity should minimise the area of an open wound and capitalise upon the tree’s natural mechanisms of growing over and sealing off. Trees are sophisticated organisms. Their large structures and longevity indicate a complex biology, efficient integrative systems and effective biological defence mechanisms. These defence mechanisms against pests and diseases are the strongest and most effective available. Arboricultural practices must never undermine, but rather complement them. Stressed and aged trees have a reduced capacity for defence and so are prone to attack by pests and diseases. Their management often requires greater care than for young healthy vigorous trees. Prevention is better than cure is the adoption of the medical model, which suggests that preventing structural deformity, disease or decay is a superior management approach than trying to remedy problems once they arise. A non- or minimal-interventionist approach should be followed, which suggests that intervention in the natural growth of the tree should only occur through necessity, and under conditions where the biology and the physiology of the organism are understood to such a level that intervention will have clear and predictably beneficial outcomes. All interventions must be done in such a way as to minimize the spread of pests and disease. This necessitates the adoption of basic hygiene when dealing with trees that have been attacked by pests or diseases. Proper urban tree management is based on a sound understanding of tree biology that informs arboricultural practice (Moore 2004). There are basic principles of tree biology that are the foundations of modern arboricultural practice, and these are of greater significance when the trees concerned are either stressed or aged (Table 1). These principles must be considered when putting tree injection processes in context. Under these principles tree injection must be seen as an invasive process that inevitably wounds the specimen involved. Accordingly, the injections should only be used when other techniques have failed and should be seen as a measure of last resort for pest control or the improvement of tree health. With old or stressed trees there is a real risk that tree injection may actually make things worse for the specimen that you are hoping to treat, which is contrary to the principles of modern arboriculture. Consequently, tree injections must be seen as a part of a comprehensive pest control or tree management program. It should only be used when other measures have failed and when the benefits of injection can be shown to outweigh the risks to tree structure, vigour and health. Proceedings of the Amenity Tree Health Workshop. Friends of the Elms, Melbourne. The discolouration is a chemical reaction within the tree. After only 4 months, reaction is seen from the drill hole at the bottom red arrow to the top arrow. Over time decay can spread throughout a trunk reducing structural integrity. Tree age, water stress and other factors can increase the degree of damage as will ongoing defoliation by Elm Leaf Beetle. Treetec will undertake stem injection if there is not a more appropriate method available.